Here are some tips from Fione Tan, President & CEO of www.eOneNet.com about how you should choose the best Internet Marketing Coach for your website and online business idea. 1. The first factor to consider is to ask whether the Internet marketing coach is making money online, and if so, how much? There is a huge difference for someone making a few thousands and another one making millions of dollars, each year. You wont need a coach who can just teach you the theory of making money online. 2. If a coach is claiming he has made a lot money online, can he prove it, by showing his online payment statement? On the Internet, beware of a lot of bogus claims. It helps if you can check their office facilities and track record. 3. Is the coach practising what he preaches? Many self-proclaimed Internet marketing coaches are overnight gurus who have made some money by selling information such as ebooks on how to make money online. Even if a coach can prove he is making money online, find out what is his main source of income. Most of the Internet marketing coaches main income is by selling making money information, and then by teaching. And if if they claim you can make millions of dollars without selling anything, or even without doing any hard work, you better beware. If you want to sell physical products, and if the coach cannot prove he has sold physical products successfully, how can he be qualified to teach you to do so? 4. Search for the keyword Internet marketing coach or Internet marketing coaching in Google or Yahoo. These keywords represent this industry and their top rankings are eyed on by millions of Internet marketing coaches globally and are therefore extremely competitive. If this coachs website cannot be found on page 1 of the search results, but he claims he can teach you how to be on top of search engines, how can he be qualified to do so? Its funny to see some websites claiming they can teach you SEO, when their sites can only be found in sponsored links such as Google AdWords (meaning they are probably teaching you search engine advertising and not free search engine optimization techniques). 5. What kind of coaching support is the coach able to offer you? Because of limited resources and manpower, most of them can offer you only email support, which is the lowest degree of support. You should find someone, or rather a reputable Internet marketing company,?who has perfected an online support system, such as online members area with uploaded course materials, online ticket system for asking and answering questions, plus support from the technical team. It will even be better if the coach can track your learning progress via an online tracking system, e.g. whether you have submitted the assignments online or attended any online meetings. 6. Can the coach offer you regional support, in particular, if you want to target the market in China? Does the coach have regional physical offices in other countries? Is he able to show you top rankings in local search engines in China and Hong Kong, and even Chinese rankings in top China search engines? 7. Has the coach groomed any successful Internet entrepreneurs, in selling different types of products, services and information? ?If yes, how successful they are? Has any of their coaching participants made millions of dollars online? You can read our Internet Marketing blog at www.eOneNet.com/internet_marketing_blog on many Internet Business models that are successfully generating income, including case stories of Internet newbies turned full-time online entrepreneurs. 8. Is the coach teaching you most of the things you need to learn to make money online during the seminar or coaching? Or is he only interested in upselling you to other more expensive seminars, programs or websites? If there are two Internet marketing coaches - one fulfills ALL the above criteria, and the other fulfils none but is charging only 1/3 of the coaching fee of the first one, which one would you choose? 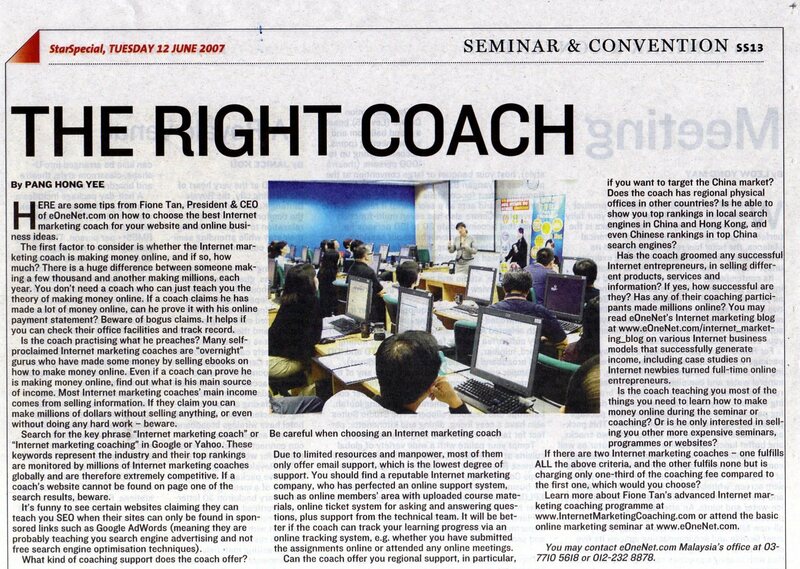 How to Choose Your Internet Marketing Coach - The Star - e1Net Internet Marketing Company News.